This is a real retro dish from the 1970's, but nonetheless still absolutely delicious. 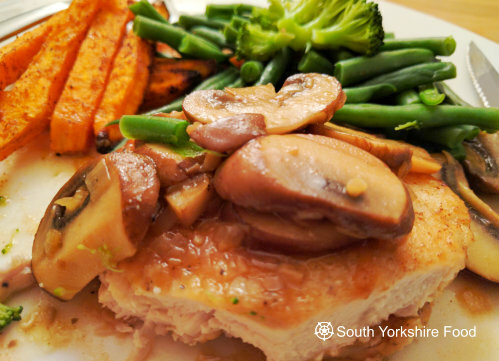 A good slug of Marsala wine gives this easy to make chicken dish a flavour twist. Ideal for a week night dinner or impress your friends with your culinary skills! Serve with sweet potato oven chips and steamed green vegetables. Toss the sweet potato chips in a little oil and then some of the spices until they are coated. Put the chips on a baking tray covered in baking parchment and cook for about 20 minutes, until they are cooked and crispy. Turn them over every 5 minutes or so to ensure they get an even cooking. Wipe the pan with kitchen paper. Heat the remaining butter and oil over a medium heat and gently fry the shallot and garlic for about 5 minutes until softened. Add the Marsala wine and increase the heat to high. Cook until the liquid has reduced in volume by about half. Turn the heat back down to medium, add the stock and chicken. Simmer gently for about 10 minutes. Put each chicken breast on a warm serving plate, and spoon over the mushrooms and sauce. Serve with oven baked sweet potato chips and steamed green veggies.